Nature Recycles How About You? 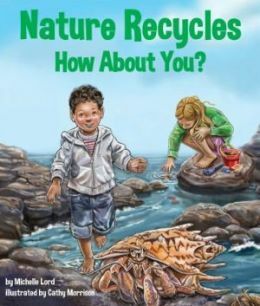 The title describes the story and makes the book immediately attractive to parents, teachers and librarians looking for interesting ways to teach young readers to ‘reduce, reuse, recycle’. First and second graders (the book targets the 4-8 age group) will enjoy learning these little known facts. The decorator sea-urchin, what an apt name, lives in the Atlantic Ocean. “The water is warm, but he covers up.” Why? To protect himself from the rough waves and the sun’s strong rays. Maybe even to hide from predators. He decorates himself with colorful algae, rocks, corals and other ocean refuse. This is clearly REuse of easily available material. The facing page poses the question: Urchin recycles. How about you? The Carolina wren uses spider webs, dog hair and snakeskin among other things to make her nest warm. The veined octopus takes discarded coconut shells to hide in when danger threatens. An Asian elephant’s ears are not large enough to keep away flies. He uses a fallen banana leaf as a fly swatter, and then makes a meal of it! Each animal description can lead to interesting classroom discussions and many reading activities. Consecutive two-page spreads — description of the animal on the left and gorgeous, full-color illustration on the right carry the story along. The question asked on the illustration page “(name of animal) recycles. How about you?” becomes a refrain that the youngest readers will look forward to, making the book an interesting read aloud. The earth also recycles. “The earth recycles water over and over.” The story ends with showing how children recycle, and the benefits of recycling. One of the strong suits of the publisher, Sylvan Dell, is providing extensive follow-up information in the back matter that can be utilized to enrich the lessons. This book has a map activity, a quiz, and an explanation of why animals recycle. There is additional material online (sylvandellpublishing.com). Click on the book cover to go to the relevant page. Title: Nature Recycles How About You?